Samsung Account: How can I change the language of the Samsung account? 2 After login using the Samsung account ID, Tap Profile. 3 Once you press on the Profile option, you will be asked for the Password again for Security measurements. 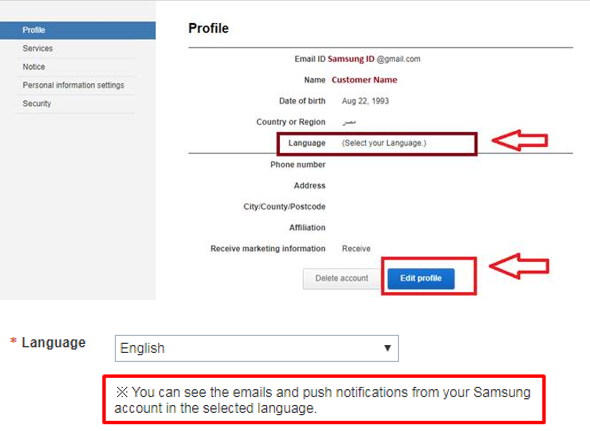 4 Then Tap Edit Profile and Press Language option to choose the preferred language which you intend to receive the emails and push notifications with from Samsung. 5 Don't forget to Tap on Save to reflect the changes you already done on your Samsung account profile as shown in the below picture. What is App permission monitor feature and how to turn it off? Galaxy S9/S9+: How can I show/hide the Apps button?